Our sisters are available every weekday, by appointment for injections, dressings, stitch removal, ear syringing and cervical smears. They also give advice on minor ailments and healthy living as well as running asthma and diabetes clinics. They carry out health screening for all of our newly registered patients as required, as well as over 75s, Coronary Heart Disease and those attending for a well person check. Advice on family planning and the menopause are also available from the nurses. The surgery also employs a practice phlebotomist who is available by appointment Monday and Thursday mornings, supplying venepuncture and a health care assistant who assists our trained nurses in their day to day duties. The health visitors are attached to both surgeries and hold regular child health clinics every Thursday afternoon. They also visit families in their homes to carry out assessments on children under 5 years of age. In addition they are available for advice on health related topics (eg diet, exercise, family health issues) to people of all ages and run regular health promotion clinics. Telephone number: 314940 to speak directly to the health visiting team. The community nurses work from both surgeries, to provide nursing care at home for the acutely and chronically sick, the terminally ill and the disabled. 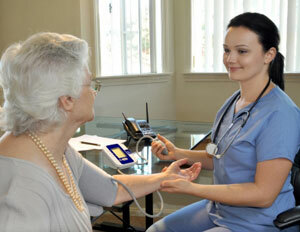 Their services are available when recommended by your doctor, the practice nurse or health visitor. Where appropriate, the services of the Macmillan and Marie Curie Nurses are also available. The counsellor works one day a week from Knowle House surgery, seeing cases referred by the GPs. Please consult your own doctor first if you think you would benefit from counselling. The midwife will provide maternity care in conjunction with your GP and holds a clinic at Knowle House each week. If you are planning pregnancy and would like pre-conceptual advice, then please make an appointment to see your doctor. This may be particularly important if you suffer from certain medical conditions, are on medication, if you smoke or drink significant amounts of alcohol, if you are unsure about your Rubella status, or if there is a family history of inherited illness. All women planning pregnancy should begin Folic Acid supplements at least 6 weeks before conceiving. Please ask at Reception if you would like help using our Health Monitor which can be found in Room A at Knowle House. The Monitor will record your height, weight and blood pressure. It can also record information about your lifestyle such as smoking habits. You can use the Health Monitor when asked to by a member of our Clinical Team or each time you visit the surgery. The Health Monitor will print a ticket for your information and will enter the results in your medical record. Using the Health Monitor can assist you in managing your own long term medical conditions and can save us valuable nurse appointments. Ask at Reception if you would like assistance in using the Health Monitor today. Maternity care is provided by all the doctors in conjunction with the community midwives who hold regular clinics in both surgeries. The doctors do not offer home deliveries, but in particular circumstances, the midwife may offer this service at her discretion. Patients who suspect that they may be pregnant or have a positive pregnancy test should initially make an appointment to see their own doctor/midwife as soon as possible. Following this appointment the patient will be referred to the midwife to be seen at the midwifes clinic as soon as possible. At the time of booking this appointment at the reception desk she will be given a maternity pack with details of forthcoming maternity care. The midwife will conduct a risk assessment on each pregnancy and discuss options for maternity care. She will organise the routine antenatal bloods to be taken, refer to secondary care if necessary and organise the patients ultrasound scan which is done at 12 weeks and between 18 and 20 weeks. A plan of care and subsequent visits will be discussed at the initial appointment with the midwife. A confidential contraceptive service is provided. Please note that we do not fit coils or contraceptive implant devices. Please telephone for the current times of these special clinics: asthma, diabetes, heart disease, hypertension, child health, well person, minor operations, immunisations and travel clinic. Please note that we run a waiting list system for patients who have been assessed by the doctor as needing a minor operation or joint injection. Your details will be added to the waiting list and you will be contacted by the Reception team with the first available appointment date.